Hello there! If you’re visiting this page you’re more than likely looking for a guide to the Top 10 Wedding Venues In Kent. We’ve put a little page together for you as (hopefully) a helpful guide if you’re still at the stage of searching for the perfect wedding venue and we’ve done our best to not only cover some of the more well know wedding venues in Kent but also a few of the smaller, less well known options that we think of as hidden gems. First of all, these are just as our opinions and in no particular order. When putting this list together the first thing we thought of was the character of the venue and the service that the team there have given to our couples in the past. 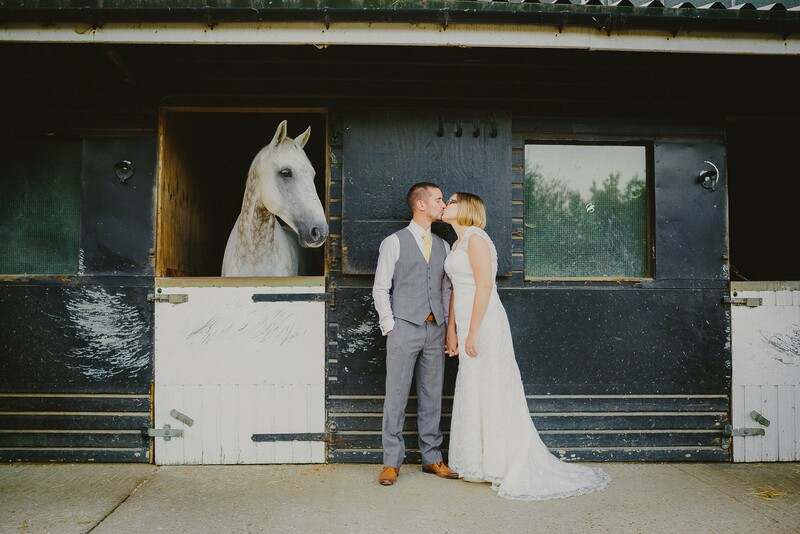 Kent has absolutely tons of beautiful wedding venues from historic Castles and country homes to country pubs, old Oasts and even venues nestled right on the seafront. Hopefully this list will cover all kinds of different places that hadn’t even crossed your mind as an option to get married in and give you a little inspiration along the way. Preston Court is a stunning barn venue with so much extra to offer. Often Barn venues can be a little bland and with little grounds surrounding them but Preston Court has lily pond studded lakes, a moated island with its own outdoor wedding ceremony structure. Additional, it’s surrounded by the owners collection of old steam trains and vintage carousels that create an atmosphere absolutely unlike any other in Kent. The team here are absolutely out of this world and the food and service they offer is exceptional. You can see some more photos from the last time we shot here earlier this summer by clicking here. The East Quay Venue as it is now known is a timber framed barn right on the Whitstable seafront. With pebbles underfoot, right up the very door and piles of Oyster shells everywhere its a truly unique venue for anywhere in the country and particularly wonderful for Kent. We’ve shot here a few times and never get tired of returning. There’s something about that view out over the estuary and seeing guests drinking outside in the sunshine on the beach with the little’un’s throwing stones into the sea that is especially photographic and always good fun. With fishing nets and all sorts of old historic fishing gear adorning the ceilings and windows its impossible not to fall in love with this place. Best of all for us as photographers is that when the sun starts to set over that horizon we’re always blessed with incredible amber sunsets that linger for ages and allow us to make stunning portraits. You can see some more photos from the last time we shot at the East Quay Lobster Shack here. A very new addition to this list as its a venue that we’ve only been to the once, just a few short weeks ago. 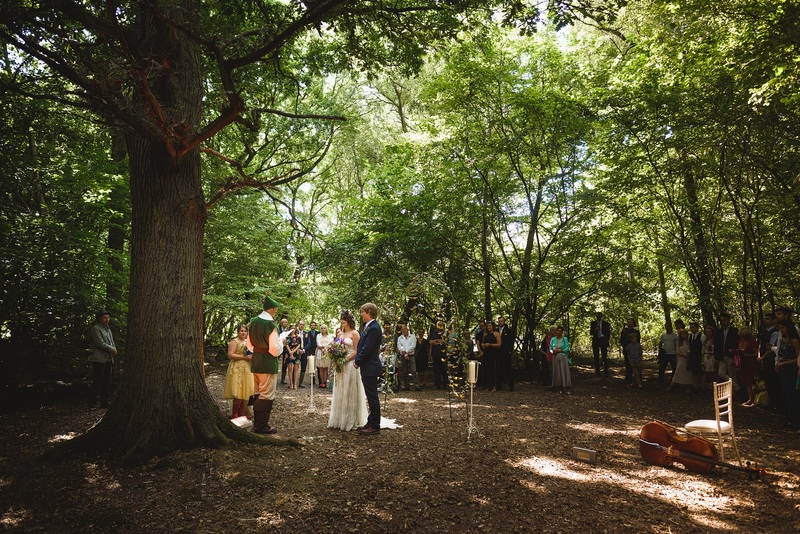 Wise Wedding Venue is a very quirky venue nestled in the woods close to Paddock Wood. You can choose to hold an outdoor ceremony on site and then make the most of everything this venue has to offer. From the swinging sofas hanging from the trees, to the loft treehosues – where you can stay the night if you choose – if you’re looking for something non traditional then this is absolutely somewhere you should consider. You can check out a few frames from our last visit here. 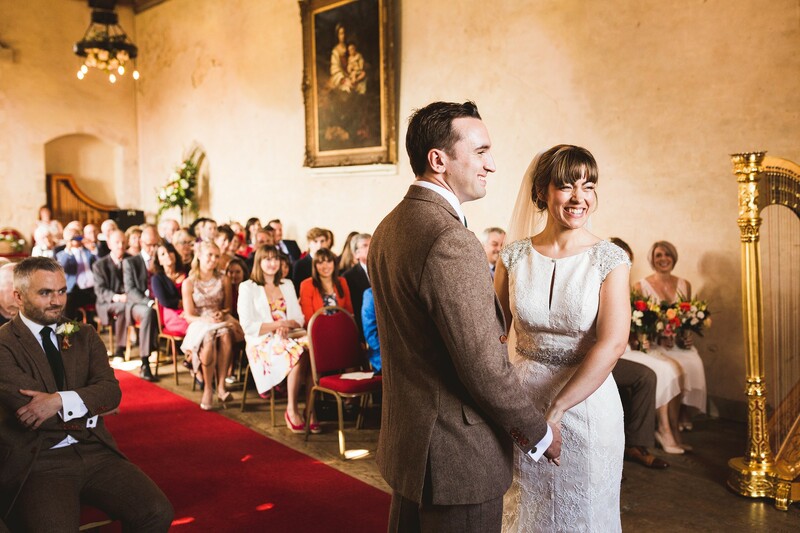 Certainly one of the most well known venues in Kent Cooling Castle Barn is popular for a reason. They do hundreds of weddings each year and for a very good reason: Not only is it beautiful and historic venue but the staff and owners run one of the slickest operations in the country. Just behind these impressive turrets is a gorgeous country barn that’s amongst the very best in Kent. To see more photos from Cooling Castle Barn click here. From one of the best known venues to one of the least known in Kent. 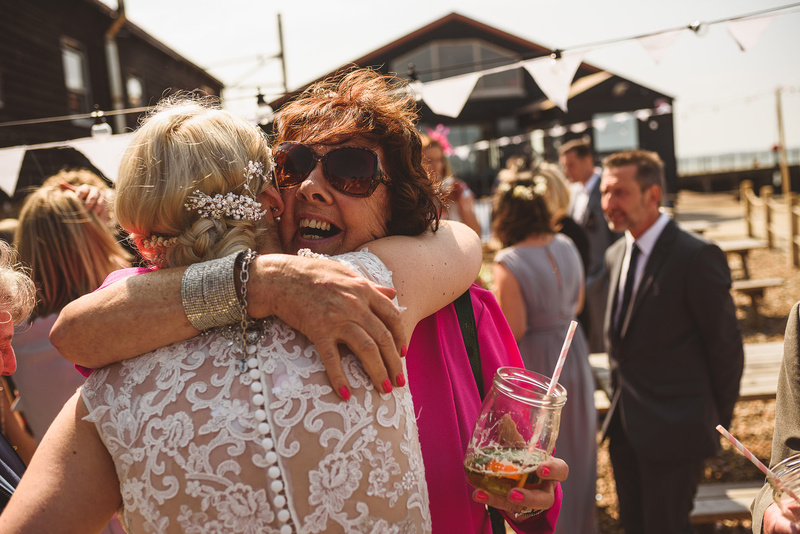 Our Top 10 Wedding Venues In Kent list is designed to throw a little light on some of the lesser know venues in our county.Oxon Hoath is easily one of my favourite wedding venues anywhere in the country. The fact that they only host a small handful of weddings here each year makes it even more special. Often used as a Yoga retreat or a dance rehearsal location Oxon Hoath is situated in the Kent countryside with incredible views out across Hadlow towards Tonbridge. It has delicate rose gardens, landscaped lawns and best of all a hidden walled garden where the venue grow a variety of their own organic flowers, fruit and vegetables that are then picked and served as part of the wedding breakfast. Inside the venue is a gorgeous library, elegant staircase and a reception room perfectly suited to a laid back yet elegant occasion. I honestly can’t recommend Oxon Hoath as a wedding venue in Kent high enough, if you’d like to see more photos from our last visit then just click here. Another really well known wedding venue in Kent now, its Port Lympne Zoo. It makes this list not only because its a stunning country house with terrific manicured gardens and ponds but because frankly, it has giraffes, zebras, baboons and Lions that you can go and visit during a safari truck tour during your wedding day which is both incredibly photographic but also a hell of a lot of fun for all your guests! You can some more photos from Vikki & Dave’s wedding day here. Again, relatively unknown (although not to us as we actually got married here ourselves back in 2010!) but a real hidden gem Nettlestead Place is a a staggering country home with surrounding rose gardens and weeping willow trees. Both the house and gardens are Grade I listed and date back to themed twelfth century. The real charm of Nettlestead lies in the Undercroft, the low arched ceilings and cosy feel created by the open fire in autumn and winter. 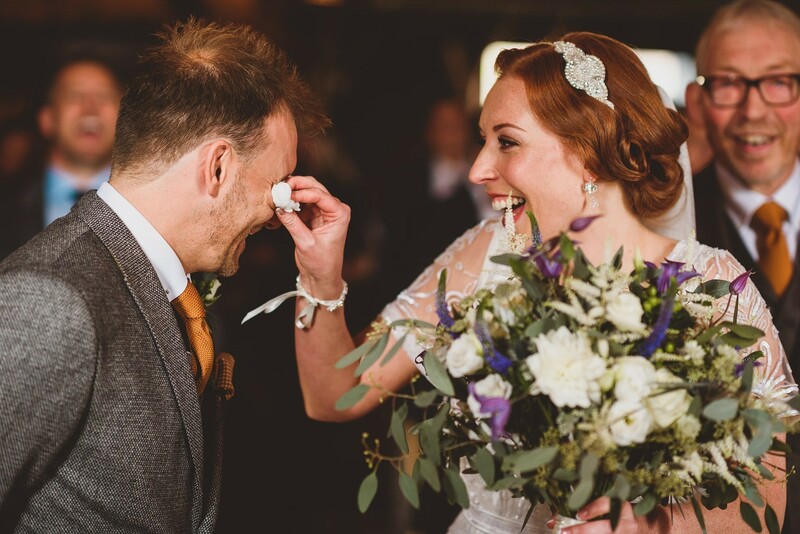 You can either hire Nettlestead Place just for your ceremony or for the full day holding the reception in the permenent marquee overlooking the river medway and the rolling Kent countryside. I shot here last summer for the first time since getting married here and had a blast, you can see more here. This a double bonus post as Hollie & Ed went back to The Swan in West Malling for their reception which is a brilliant pub venue in its own right! Another real hidden gem St Augustine’s Priory (often known as Bilsington Priory) is a truly historic, medieval Priory close to Ashford. 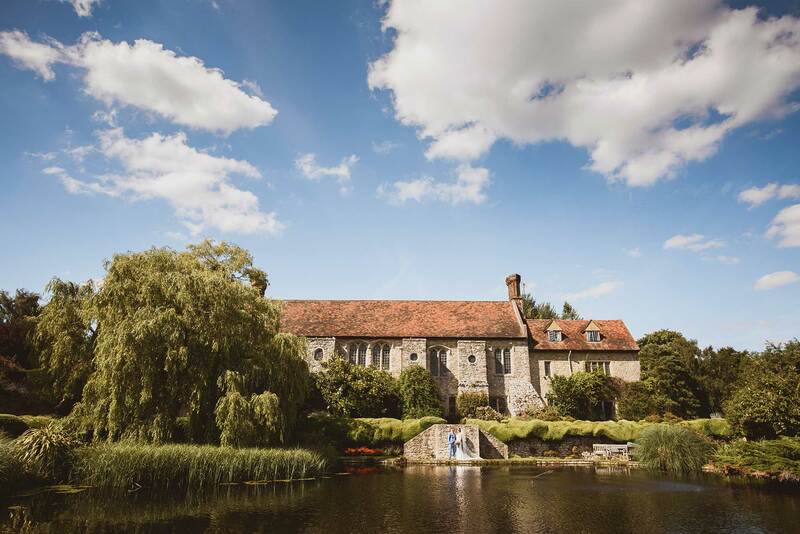 It’s not hard to see why St Augustines Priory won the award for Wedding Venue Of The Year at the 2015 Kent Wedding Awards which makes it almost an instant entry in our Top 10 Wedding Venues In Kent. 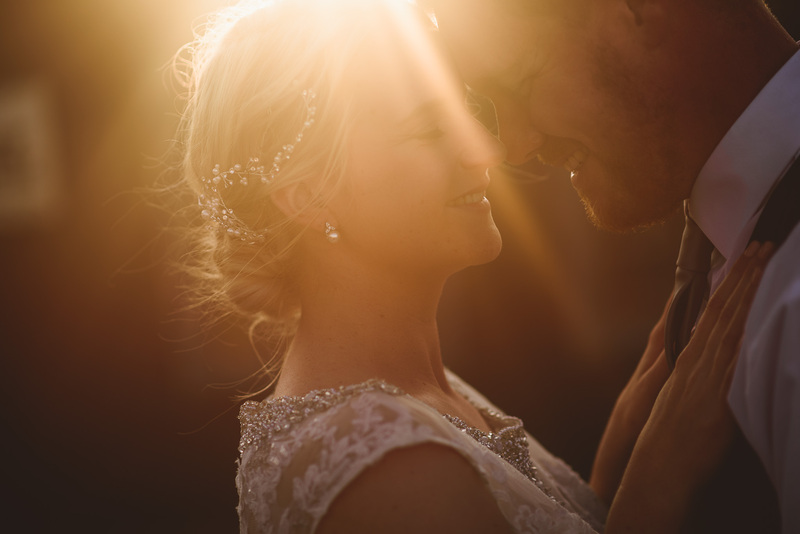 We last shot here back in 2015 and you can see photos from Laura and Luke’s day here. It’s been a little while since we last shot at Honnington Farm Gardens in Tunbridge Wells but it left such a lasting impression us that it was always going to crop up on this list. 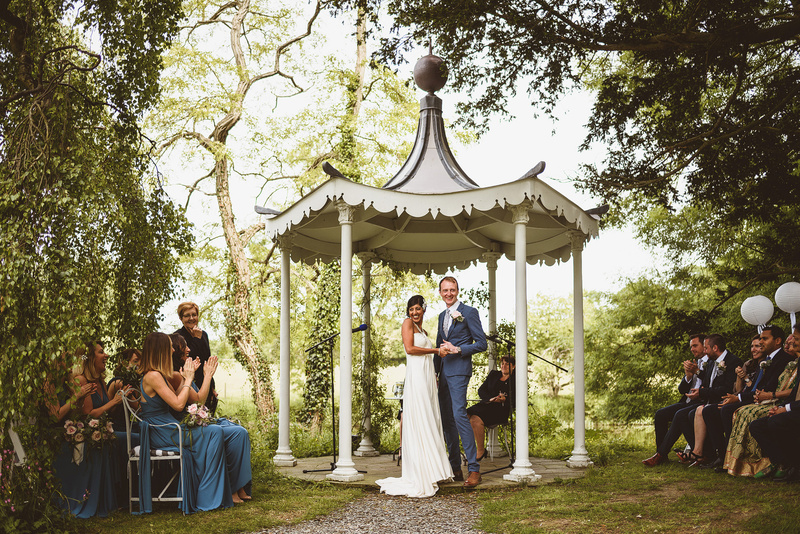 Within the stunning gardens and estate is the 200 year old “The Old Barn” which over the past few years has been lovingly restored and perfect for a relaxed, informal wedding ceremony. You can see more from our last visit here. Easily the grandest and most historic venue on this list Leeds Castle has been home to Kings and Queens for centuries including Henry VIII. 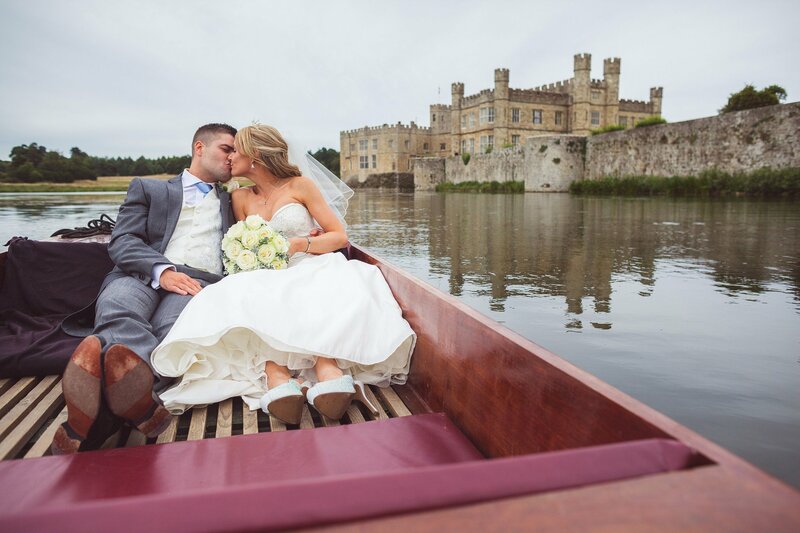 Surrounded by its own Moat, Leeds Castle is a truly incredible place to get married and whether you get married in the main castle or The Maidens Tower its equally impressive. Easily one of the Top 10 Wedding Venues In Kent without a shadow of a doubt. Check out more of our work at Leeds Castle here. The Bell In Ticehurst is one of our all time favourite venues and one that we cannot recommend high enough. Situated in tiny little village in East Sussex The Bell is a quaint, country pub that as soon as you walk through its doors you realise that its so much more than just a country boozer. From the converted stables where couples walk across the tables whilst their guests throw confetti to the chandeliers hung from the dining room its truly a one off. The staff are incredibly attentive, the food out of this world and the atmosphere any time of year is unrivalled. We’ve been fortunate to shoot here a number of times and never tire of going back, you can see photos from our last visit here. There are very few places in the South East where you can enjoy your wedding day eating canapés and drinking champagne whilst feeling the sand between your toes. 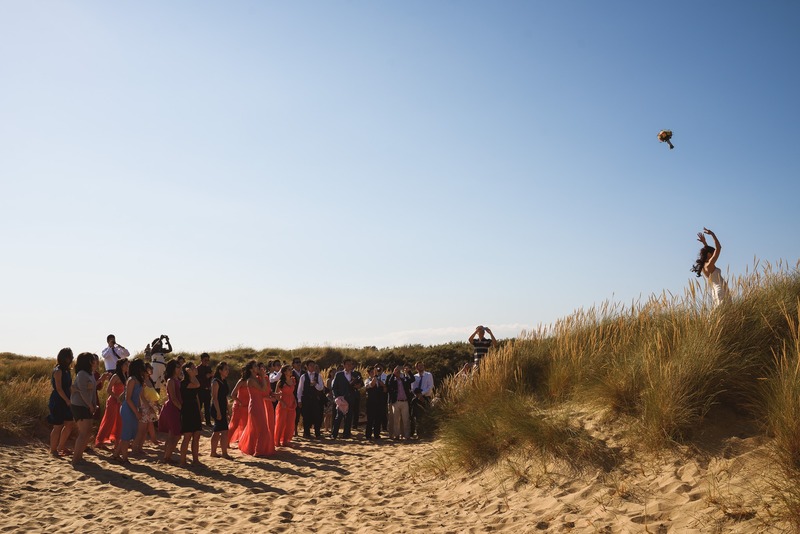 The Gallivant is a dream venue located just at the bottom of the dunes of Camber Sands. Incredibly stylish and effortlessly cool The Gallivant is the perfect venue for a Beach wedding but without having to hop on a plane. We had a blast here last year, it’s hard not to enjoy photographing guests having fun on the beach, launching bouquets from the top of the dunes and releasing sky lanterns late in the evening. You can check out our work here. If none of those options are what you were hoping for the perhaps a wedding at home or on private land would suit you better? Over the years we’ve shot a lot of weddings in marquees, Yurts and Tipis. These kinds of weddings are becoming more and more popular as people look to put their own individual stamp on their day and create a wedding day that is totally unique to them. Recently we’ve seen a huge popularity for Tipi Weddings with tents supplied by brilliant companies like Beautiful World Tents or Holmstead Events. These tents come in various shapes or sizes and can be either a single tent or three or four linked together. 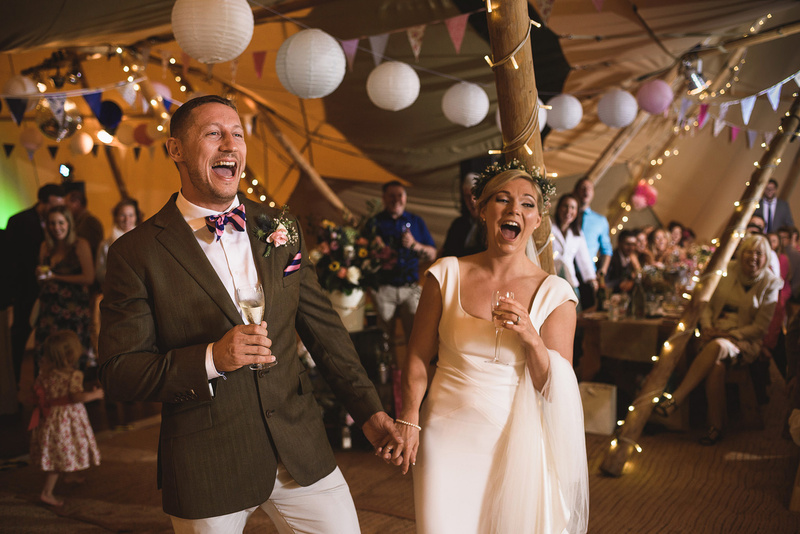 We absolutely love shooting in Tipis as the atmosphere they create works with our style absolutely perfectly, they’re really laid back, informal and unscripted and can provide the absolute perfect setting for a heck of a party that roars late into the night. A few weeks ago we shot – and I was Best Man – our best friends wedding in a Tipi in the Kent countryside and had an amazing day. You can check out the photos here. 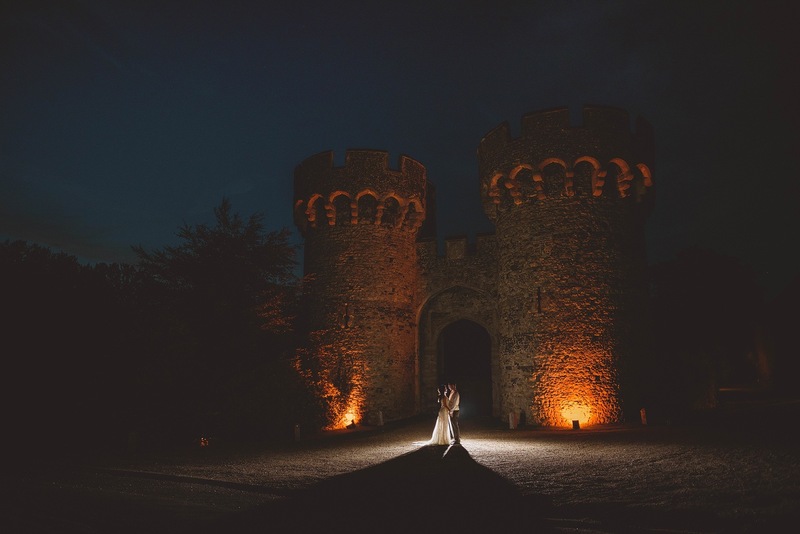 I hope you’ve really enjoyed our Top 10 Wedding Venues In Kent list and found it useful. I hope its given you some ideas and maybe brought to your attention some local venues that you didn’t even know existed. Planning a wedding starts with searching for the perfect wedding venue, maybe its on this list and you’ve just fallen in love with somewhere? We’re really spoilt for choice here in Kent! If you’d like to keep up to date with all of our Recent Work then head over to the Blog that we keep updated every week.